A few years ago, while browsing through shops with my wife, Carolyn, in Galveston’s Strand District, I found a book of short stories about several Texas crimes and criminals. 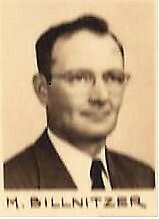 One account was of a Houston police narcotics scandal that occurred in 1953.
were vague, some involved a captain of police being shot, others of the captain shooting another officer. As a rookie cop, I didn’t ask questions, but I never forgot the stories. The book I found in Galveston years later, prompted Carolyn and me to take a journey of research and writing, the end result of which is our latest book, Dishonored and Forgotten. My previous books have all been fiction and required little research. This book was much different. With Carolyn’s advice (her writing background includes such research) I spent days in Houston’s library system, reviewing old newspaper articles and searching the internet where I made contact with a family member of the officer who was killed. Our digging eventually led to a treasure trove of information on the case which was housed at Stanford University in California. The lead federal investigator on the Houston case had archived and retained records related to his work, including the Houston scandal. 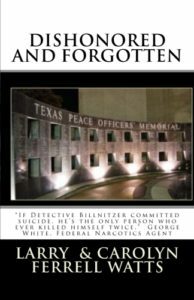 The file contained personal letters from officers involved in the case, documents generated by federal government employees, and even a crime scene photo of Detective Martin Billnitzer, lying dead on the floor of the Houston police station. When that investigator, George White, died, his widow had donated his papers to the university. Before my wife and I decided to write the novel, I began posting blog stories of the incident on my website. I interviewed the daughter-in-law of the then police chief, relatives of officers who were involved or were working at the Houston Police Department at the time, and others. As a result of these blog stories, we were eventually contacted by a great-niece of the drug dealer and pimp who played a major role in the downfall of a police chief, sending a police officer and a doctor to prison, and pulling the curtain back on real problems within the police department. This book has been the most interesting adventure in writing I have undertaken, in no small part because it is the first time Carolyn and I have worked together on a book. We are scheduled to present and discuss the book on January 12 at the monthly meeting of the Houston Police Retired Officers Association. It is now available here and wherever good books are sold. I hope you enjoy reading it as much as we have enjoyed making it available.